Navajo Generating Station is a 2,409-megawatt coal-fired power plant located on the Navajo Indian Reservation near Page, Arizona. The plant is planned for retirement in 2019. The Navajo Generating Station is located about 25 kilometers from the Grand Canyon National Park. In 1987, a National Park Service study demonstrated that the plant impacts the air quality at the park and contributes to the wintertime haze at the Grand Canyon. The plant consists of three 803 MW nameplate capacity units that provide power to Arizona, Nevada, and California. The Los Angeles Department of Water and Power owns 21% of the power generated by the plant. It was assembled during the 1970s and began producing commercial power in 1975. The construction costs were $650 million, with an additional $420 million for new environmental scrubbers. In 2015 the Los Angeles Department of Water and Power pushed for early retirement of unit 1 at Navajo Generating Station as a condition of selling its 21% stake in the Arizona power plant to public utility Salt River Project. Unit 1 will cease operation by the end of 2019. In February 2017 the utilities that own the plant voted to close all three coal units when their lease expires at the end of 2019. The coal plant has been more expensive to run than lower carbon alternatives, according to the plant owners. The plant’s coal supplier, Peabody Energy, had launched a long-shot bid to find a buyer to save the plant and the coal mine that has no other customers. New York-based Avenue Capital and Chicago-based Middle River Power showed interest and proposed a plan to run the plant at less than half its capacity to prolong its life. But in September 2018 the companies terminated the effort, saying they could not get anyone to commit to buying power from the plant. The power plant is served by coal mined at Peabody Western Coal Company's Kayenta Mine near Kayenta, Arizona and hauled by the Black Mesa and Lake Powell railroad. The Kayenta mine ships about 8 million tons of coal each year to the power plant, which uses up to 25,000 tons of coal per day when all units are fully running. Each year the plant also uses nearly 8 billion gallons of water from Lake Powell for cooling. Hot side electrostatic precipitators (ESP's), constructed as part of the original plant, remove 99% of particulate from the flue gas. The SO2 scrubbers remove an additional 50% of particulate remaining in the flue gas after passing through the ESP's. Each unit has a forced oxidation wet scrubber for flue-gas desulfurization, using limestone slurry in two countercurrent–flow absorber vessels to remove 92% of SO2 from the flue gas.The three scrubbers in total consume about 24 MW of power, and use 130,000 tons of limestone and 3000 acre feet of water per year, producing 200,000 tons of gypsum per year. In 1991, as a result of years of litigation by environmental organizations and citizen activists, the U.S. Environmental Protection Agency required a 90% reduction in sulfur dioxide emissions from the plant. Low NOx burners with separated over fire air are used to control nitrogen oxide emissions. NGS was built with one of the first zero liquid discharge (ZLD) systems in a power plant, recovering all cooling tower blow-down and runoff from developed areas of the site. The waste water is processed through three brine concentrators and a crystallizer, which remove the solids and produce distilled water for re-use within the plant. Several lined ponds are used in conjunction with the ZLD system to capture and regulate the flow of waste water to the system. The plant sells about 500,000 tons of fly ash per year for use in the manufacture of concrete and Flexcrete insulating block building product. Bottom ash and gypsum, a byproduct of the scrubber operation, are dewatered in the removal process; and, along with any fly ash not sold, are landfilled on-site as solids. No wet impoundments are used for ash or byproduct disposal. 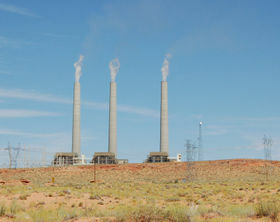 The Navajo Generating Station has "[e]xisting pollution control equipment at NGS includes scrubbers for SO2 control, hot-side electrostatic precipitators for particulate matter, and all three units are being retrofit with modern low NOx burners and separated overfire air for NOx control." In February 2010 the EPA established a Federal Implementation Plan that "establishes federally enforceable emissions limitations for sulfur dioxides, total particulate matter, and opacity, and a requirement for control measures for dust." The plant releases more than 19 million tons of carbon dioxide per year. In 2004, it was the nation’s fifth largest power plant emitter of carbon dioxide and eleventh largest emitter of nitrogen oxides. According to a 2009 report by Environment America, "America's Biggest Polluters," the Navajo Generating Station is the eighth dirtiest plant in the nation, releasing 20.1 million tons of carbon dioxide in 2007. Ranking is based upon Environmental Protection Agency data. The 2010 Integrated Resource Plan of the Los Angeles Department of Water and Power (LDWP), a strategic plan for the next 20 years, recommended that LADWP add 630 new megawatts of solar capacity by 2020 and 970 megawatts of solar capacity by 2030. The plan recommended 580 megawatts of new wind power by 2020. The plan designated that 40 percent of solar be in-basin. It recommended incentive programs, feed-in tariff schemes, and other mechanisms for promoting solar. The plan recommended ending purchases of power from the coal-fired Navajo Generating Station by 2014, which is five years ahead of the deadline established by California state law. The plan recommends ending use of power from the Intermountain Power Station by 2020, seven years ahead of the scheduled end of such purchases. The plan states that "LADWP is open to a mutually agreeable early compliance plan between the project participants that preserves the site and transmission for clean fossil and renewable generation." Coal-fired power plants provide Los Angeles with 44 percent of its energy. In March 2010, the L.A. Department of Water and Power (DWP) Board of Commissioners unanimously approved Los Angeles Mayor Antonio Villaraigosa's initiative that will create green jobs and harness the area's ample sunlight. The solar power generation will wean the city off of coal. The City Council approved the measure in March 2010 and will work to eliminate electricity produced by coal by 2020. However, it was reported in December 2010 that DWP may not reach its renewable energy goals set by Mayor Villaraigosa due to a lack of funding. DWP executives warned that they would not be able to sustain that achievement, let alone reach future goals, without guaranteed funding from taxpayers. In November 2010 the Black Cross Movement planted symbolic black crosses in front of the Navajo Nation's Kayenta Mine in New Mexcio, which was named in the spring of 2010 as one of the most dangerous mines in the country. On December 2, 2011 sixteen people were arrested at the Salt River Project (SRP) offices in Tempe, Arizona. The protesters demanded that Salt River Project shut down the Navajo Generating Station. The protest was the third in three days, all targeting the American Legislative Exchange Council (ALEC). ALEC is a policy research group that focuses on building private-public partnerships. SRP lobbyist Russell Smolden is Arizona’s private sector chair in ALEC. Leaders of three American Indian tribes said in a Congressional hearing on May 26, 2011 that closing a coal-fired power plant in northern Arizona would devastate their communities, leave hundreds without jobs and threaten water rights settlements. Others that supported the closure spoke at the hearing on the role of Navajo Generating Station stating that the dire predictions are overblown. They urged Congress to transition the plant from coal to renewable energy to protect people's health and the environment. Navajo Generating Station and the Kayenta Mine contribute about $140 million in revenue and wages to the Navajo Nation, while the Hopi Tribe receives $13 million for its coal and water. Some 1,000 people are employed at the plant and the coal mine, the majority being American Indians. ↑ EPA Clean Air Markets Data & Maps. US Environmental Protection Agency. Retrieved on 2011-05-30. ↑ GE Water & Process Technologies – RCC Thermal Products & ZLD. General Electric. Retrieved on 2011-05-20. ↑ Navajo Flexcrete Building Systems. Navajo Housing Authority. Retrieved on 2011-05-25. ↑ "Air Actions, Navajo Nation" US EPA, February 25, 2010. ↑ "Leaders Needed to Move LA Beyond Coal and Into the Sunlight" Bill Corcoran, Huffington Post, March 23, 2010. ↑ http://articles.latimes.com/2010/dec/06/local/la-me-dwp-dysfunction-20101206/2 "DWP quietly scales back Villaraigosa's ambitious renewable energy goal"] David Zahniser, Los Angeles Times, December 6, 2010. ↑ "Pattern of Violations: Black Cross Movement Calls Out Dangerous Navajo Coal Mines" Jeff Biggers, Huffington Post, November 4, 2010. ↑ "Arizona coal plant focus of congressional hearing" Felicia Fonesca, Bloomberg, May 25, 2011. Wikipedia also has an article on Navajo Generating Station. This article may use content from the Wikipedia article under the terms of the GFDL. This page was last edited on 21 September 2018, at 21:41.